This morning in 1817, a Colombian seamstress was shot in Bogota for spying on the Spanish forces fighting to quell South America’s Bolivarian independence movements. 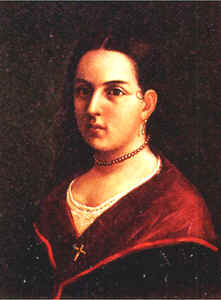 Policarpa Salavarrieta — it was the name her brother used for her; her legal given name and origin are romantically lost — was infiltrated into Bogota during the reconquista, when a Spain recovering from Napoleon’s intrusion deployed in force to quash the separatist aspirations of its New World colonies. It was the day of Simon Bolivar, but Spain had completed its apparent pacification of New Granada* in 1816, and established a stronghold in Bogota. Subversives had to mind their P’s and Q’s. Although she was a known agitator in the city of Guadas, “La Pola” could slip into Bogota without drawing attention. There, she used her skills as a domestic to hang around royalist households, sewing up clothes while snooping around, and helping revolutionaries recruit soldiers. She was arrested when the Spanish busted the network, (the link is in Spanish) and shot publicly with her lover, Alejo Sabarain, and a number** of others — all men, none of them half so well-remembered or beloved as Salavarrieta. She was supposed to have ignored the priests murmuring te deums in her ear on the scaffold in order to exhort the onlookers to resistance. Over the years to come, she would become an emblematic martyr of independence; just see how many times her theme is visited in this history of Colombian painting (Spanish again). She’s also the only historical (not mythological/allegorical) woman ever used on Colombian currency. As will be readily surmised, of course, she merits her tribute because the movement in whose service she died soon rallied and carried the day. * The Spanish territory of New Granada encompassed most of the ice cream of the South American cone. ** Various numbers are given for the day’s total execution count. This site (Spanish) says a total of nine — Policarpa Salavarrieta and eight men, including Alejo Sabarain — and persuasively names all of them.